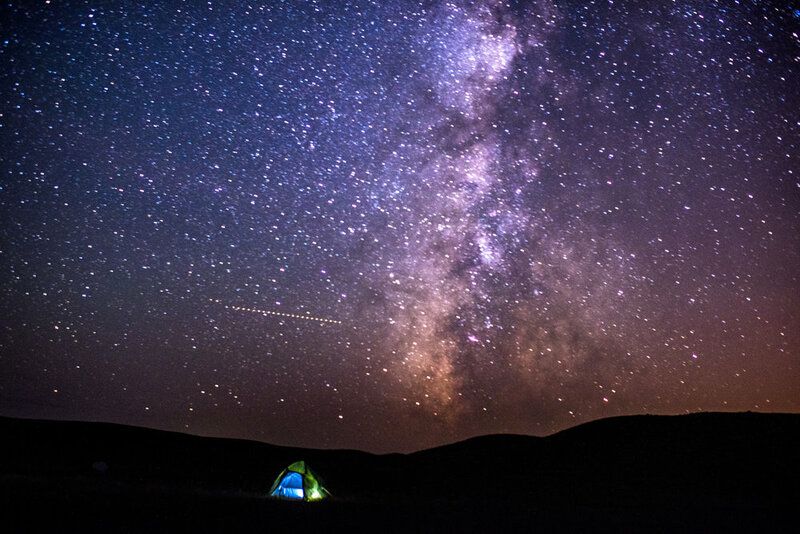 One of our tents under the Milky Way in Moose's Pasture. I watched the Great American Eclipse from one of the most American places on Earth - a cattle ranch in Sheridan County, Nebraska. The eclipse has been a future event for an eternity now; something we have been thinking about and planning for a long time. When it finally got here, it ended far too quickly. The Nebraska Project has been the air I breath for the last three years. I’ve spent more time in America’s sandhills than I ever imagined I would. In fairness, until a few years ago, I didn’t know the sandhills even existed. I thought - like most people - that Nebraska was a flat land of corn and cows. What I have found instead - the rolling hills, the endless sky, the rugged badlands - is some of the most surprisingly beautiful country on Earth. There is no place I would rather watch day become night than a cow pasture in Western Nebraska. This particular pasture is one of my favorites. I’ve probably spent a total of a month in this particular spot over the last three years. The closest “city” (city being a town of about 8,000 people) is over 40 miles away, so the night sky screams with cosmic beauty. You don’t just see the Milky Way, but galaxies beyond. Setting up an overnight, motion-controlled time-lapse at sunset. The field is called Moose’s Pasture, named after a horse called Moose. I never knew the origin of the name until this trip, when we found the bony remains of Moose himself (Moose even made a cameo in the time-lapse video - see below). This trip was work, but it was also play. We had friends join us in Moose’s Pasture from New York, Colorado and Texas. When Bill and I camp out, it’s rustic. With all the camera equipment we travel with, we pretty much only have space for our tents and sleeping bags. But our friends brought the works - stoves, generators, tables, chairs, a fire pit, food, a camper and a side-by-side. We quickly turned Moose’s Pasture into a temporary town. Our temporary city in Moose's Pasture. Each night we sat under the stars and talked about life and photography. The pasture itself is a technological purgatory - the only cell service available was atop a very steep sandhill - forcing us to enjoy the company provided. We spent a total of four nights in Moose’s Pasture - two before and two after. We wanted to arrive enough ahead of time to map out exactly where the sun would be at the moment of first contact, through totality, until fourth contact. We knew eclipse day - August 21 - would fly by and wanted to be prepared well in advance. Planning notes for the eclipse. We used a total of 30 cameras and lenses for the eclipse - everything from a 14-24mm f/2.8 to an 800mm f/5.6 on D5, D500 and D810 bodies. Cameras, lenses and tripods, built and ready for totality. Not one of us had ever personally witnessed a total solar eclipse before. We had each spent hours researching the different stages, different filters and different settings, but wouldn’t know for sure what would work best until the moment the moon covered the sun. To make sure we got the shots we wanted, we had several duplicate setups with slightly different settings and filters. Setting up at D810 with a 14-24mm f/2.8 with a 10-stop filter behind some wildflowers. The lead up to the eclipse was intense. We had every camera checked and double checked and placed in the pasture at least an our before first contact. Once first contact began, we didn’t want to be scrambling for cards, batteries or different lenses. We had cameras pointing directly at the sky, cameras behind a windmill, cameras behind wildflowers, cameras overlooking the valley, cameras on top of sandhillls, motion-controlled cameras. Our favorite piece of timel-apase equipment - the Cinevate motion-control sytem on their Atlas 200 slider. It's the most solid motion-control equipment available. We wanted to see the eclipse from every angle. We weren’t just concerned with what happened to the sun, but what happened to the land. What we experienced was not in the literature I read. In honesty, I thought the eclipse was going to be overhyped. It’s the only thing I have heard about - outside general news - for months. And, frankly, for the first 80 minutes, I felt it was. Then, when the sun was about 90% covered, the light took on a silver hue - a color temperature I have never seen - the air temperature dropped about 20 degrees, the wind - which had been blowing ceaselessly - picked up, and the crickets began singing. As the moon finally enveloped the sun a ring of orange appeared on the horizon, the clouds surrounding the moon and sun glowed an eery blue, and a star appeared to the west. Just before totality I pointed my unfiltered 600mm f/4 toward the sun and captured this image through thick clouds. Still, the night sky we had been promised never happened. While it got significantly darker, it was nowhere near the darkness we had read about. All the cameras we had setup to capture that darkness had to be quickly changed. I yelled some unsavory remarks and ran to each camera, trying and failing to change them all; all the while being sure to look around myself for at least a moment to take in the scene. Totality seemed to last for a split second. Looking back at the time stamps in each camera, it lasted for two minutes and thirty one seconds, but in the moment it felt much shorter. Once totality was over I cursed myself for missing so badly on the dark exposures - most of the frames were pure white. Completely unusable. Everyone told me not to worry about it, that it was impossible to predict something I had never experienced. Still, when you spend so much time and energy to get something right, getting it wrong stings. That sting was relieved a bit the next day when I opened up a file from a 35mm on a D810 I had directly under the windmill and found the picture I had been hoping for. The one wide angle frame I got of totality. A picture that would not have worked if it had gotten as dark as I had planned on it getting. My one wide-angle frame from the midday moon. I stayed up late the night of the eclipse processing time-lapses. Deadlines don’t care if you’re in a wifi-less pasture. The next morning I woke up to everyone packing their things at 6:30am. I sleepily said my goodbyes before going back to bed (bed being a small thermarest and a sleeping bag). When I emerged from my tent 2 hours later, Moose’s Pasture was empty. The cadre of friends had left. The event we had been anticipating all year was over. I walked over to my small gas burner and made coffee. Then I sat on a pelican case by myself - the chairs and table had left with the early risers. I took a deep breath of the unseasonably cool morning air. The stress and adrenaline from the day before melted away and I was left with deep sense of gratitude. Gratitude for the incredible experience, the friends that made Moose's Pasture a temporary home, and the time I have been lucky enough to spend in Nebraska's beautiful sandhills.